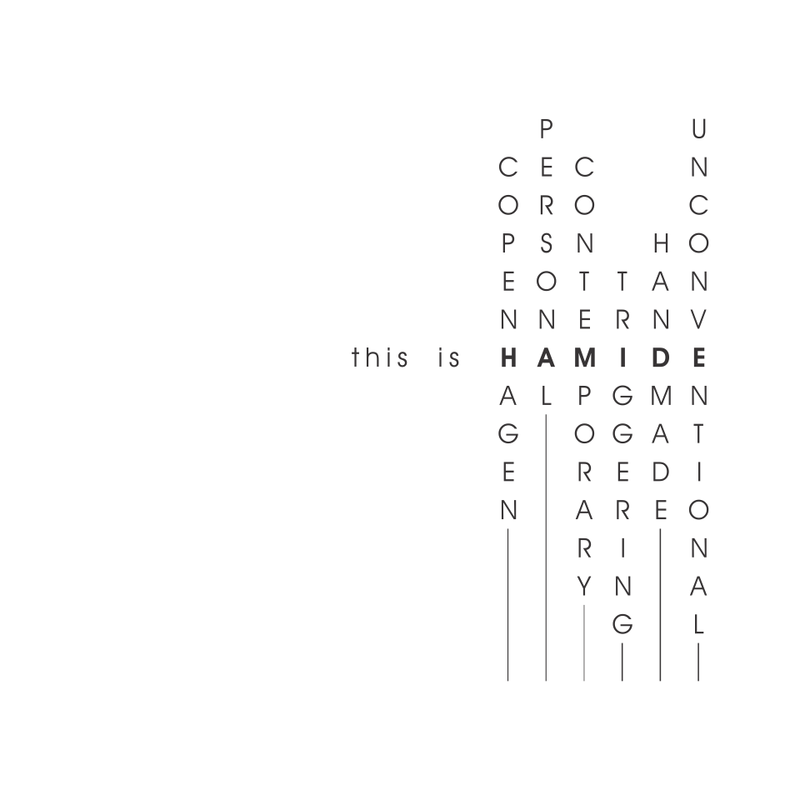 Who is Hamide Design Studio? “Copenhagen, personal, contemporary, triggering, handmade, unconventional, empowering, feminist, humanist, immigrant, curious, strong, ambitious” are some of the words to describe us. We are a Copenhagen based design studio working at the intersection of design, art, and technology. We create our own collections under Hamide brand and offer design consultancy service to other companies. With brand Hamide we aim to enhance the everyday life by creating aesthetic experiences through both limited and open edition collections. In our consultancy work, we design products, communication materials or services that answer the needs of our clients. Our design process values empathic creativity, in other words, we love walking in others’ shoes with a creative mind. We care deeply about local production, sustainable and slow living. We are drawn to the idea of reinterpreting contexts, materials, and methods. Our work is characterized with simplicity as well as fusion and humor. Our products are mostly made in Copenhagen, and some of them are handmade by us, Seda and Şeyda Özçetin. With various of our 17 collections, we are currently present at the leading design and museum shops and also bookstores in Copenhagen such as Danish Design Museum Shop, Danish Architecture Centre Bookshop, DANSK made for rooms, Justspotted, and also Lexis Paper in Sweden, and Nordisk Rom in Norway. We were published in the book Danish Art Prints as one of the 66 art print makers in Denmark as well as in design magazines, blogs and newspapers as Wallpaper, Rum, Alt Interior, Boligmagasinet, Mad og Bolig, Scandinavia Standard, the Sweet Spot, Boligcious, Our Creative Place, the Murmur and Politiken. In addition to these, we started up and run two non-profit projects: Pomegranate and the social movement “I Feel From”. We regularly organize workshops, talks, exhibitions with a focus on immigration and national identity. We have exhibited in design fairs for several times as Northmodern, Design Trade and Vivanti, as well as curated and exhibited in Copenhagen art gallery VESS “Pomegranate #1”, at Space a+ “I Feel From”, at DANSK made for rooms “Leftovers”, at Atelier September “Jonas’ Julekort”, at PB43 “She is an Eastern Bird”, and have participated in design festivals as Trapholt Museum Graphic Design Festival. Our work was also selected and exhibited at Taipei Design & City Exhibition 2016. We are also co-creators as well as visual identity and experience designer of Lyran concert series in Lund Sweden. We have been a member of Design Denmark, the professional organization for designers in Denmark, between 2014-2016 and CPHmade since 2013. We took the tragic course of events in our lives to create something beautiful and empowering. We take pride in this! Hamide Design Studio came to life with the aim of honoring designer and tailor Hamide Yanç Özçetin, mother of the founders Şeyda and Seda, who has created inspiring, functional, and innovative designs but never had the recognition and appreciation she deserved. Unfortunately, Hamide was diagnosed with CBGD illness (an atypical Parkinson’s disease) in 2007 and had to quit the profession she loved. She passed away on the 25th of February 2013 in Copenhagen. Hamide´s struggle with CBGD since 2007 has not been easy either for her or for us. It has been extremely difficult for such a creative and productive person not to be able to do anything. It has also been very difficult for us to see her in such condition. This is how Şeyda came up with the idea to create the brand “Hamide”. She wanted Hamide to finally get the recognition she deserved and have more to hold onto in her struggle with CBGD. Thus, the brand “Hamide” gets its essence from Hamide’s design approach which is based on creating beauty without sacrificing from usability, simplicity, honesty, and sustainability. Her highly crafted work was characterized with geometrical forms, unconventional decisions, making sense of leftovers, and reuse of products. Exploring her legacy, with the brand “Hamide” we aim to create various collections that combine beauty with function to be used in everyday life ranging from clothing to accessories, and from home textiles to stationery goods. We also aim to position “Hamide” as a platform that supports undiscovered local craftsmen, craftswomen, designers, and artists by collaborating with them through our collections. We are two strong women with world class design and art educations and a great role model. We have a vision that puts design at the center for changing the world for the better. Seda holds MSc. and BA degrees in industrial design from METU as well as MSc. degree in entrepreneurship from Lund University. She loves design profession for its power to change the world for the better and believes that creative entrepreneurship holds great value to contribute to dealing with the challenges of today’s world. Hamide was born in Gaziantep, Turkey, in 1944. 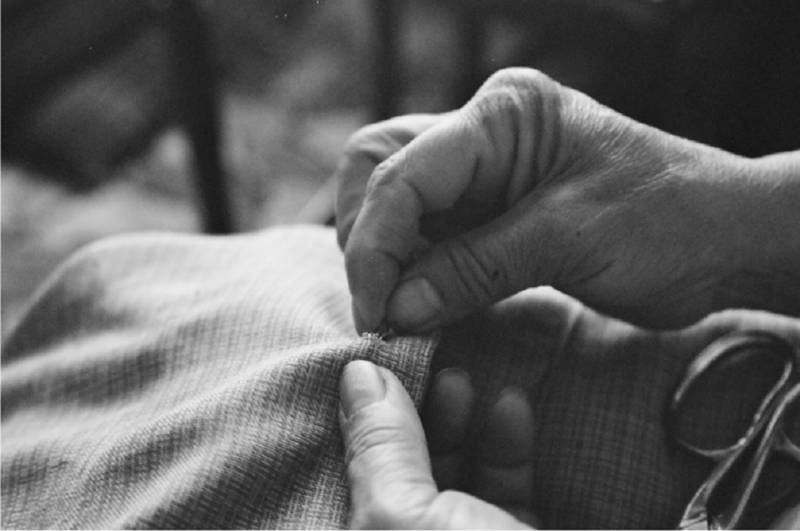 At the age of 10, she was assigned to assist a local tailor master. During her apprenticeship years, she worked on all stages of cloth making. In 1971, she successfully graduated from Istanbul Institute of Tailorship. 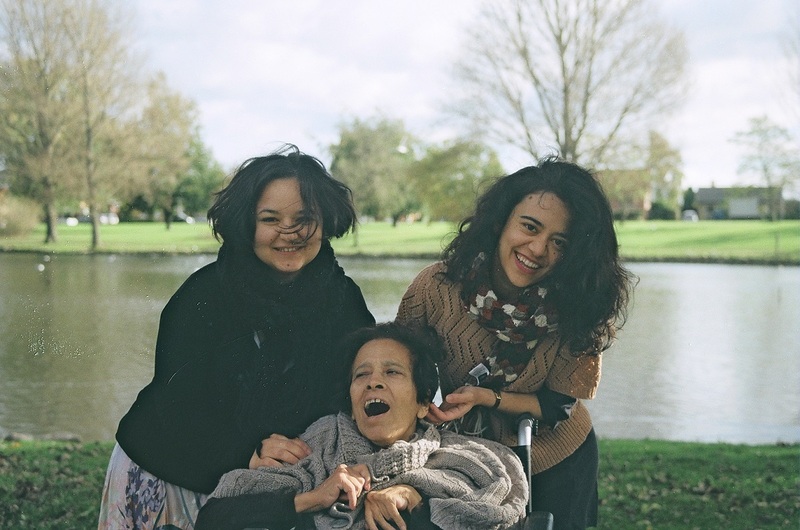 From the age of 10 til she was diagnosed with Parkinson’s in 2007, she has created many unique clothes as well as personal accessories. Şeyda holds MA in visual culture from Lund University and BA in archaelogy and art history from Bilkent University. She also has a background in music. She is interested in art and culture, feminism, activism, sustainable living. She believes in the power of design, art and small creative businesses in changing the world for better. “What Do We Care About? What Do We Love?” are the questions we ask to ourselves not to lose focus on what matters in our work and life. For us there is no small help. We are all responsible in contributing to the societies we live in and help the people in need. We have supported Unicef on monthly basis through the purchase of “School Starter Kit for 30 kids“. We have had a campaign for donating the profit from “Immigrant & Fabulous!” prints to Trampoline House. We support SOS Børnebyerne through special campaigns we run from time to time. Mothers’ Day 2015: %80 percent of webshop sales on Hamide products on Mothers’ Day was donated to SOS Børnebyerne. 2. Hamide Days, 2015: %80 percent of webshop sales on Hamide products during 2. Hamide Days is donated to SOS Børnebyerne. We have supported Dansk Flygtningehjælp by donating the profit from the sale of “Immigrant & Fabulous!” prints. We have supported the campaign Hjæalp Wasi, created for refugee boy Wasi, the protagonist of the documentary “Drømmen om Danmark”, with profit from the sale of “Immigrant & Fabulous!” prints within a specific period. We believe in professional solidarity and building relationships for future collaborations. Design Denmark is the professional organization for the design industry in Denmark working to promote design in business and society. CPHmade is a business network promoting Copenhagen based craftsmen and designers doing local production. We love sponsoring projects we believe in and helping them create valuable experiences for the public.